Ned Rozell | Geophysical Institute Oct 13, 2015. Kristen Rozell holds a golden-crowned kinglet that hit a Fairbanks window during a snowstorm. Ned Rozell photo. As piles of wet snow fell, an unexpected guest rapped at the window. My wife, Kristen, heard it bump into the glass. She was soon cupping in her hands a delicate bird she saw perched on the windowsill. “It’s a golden-crowned kinglet!” she said. Kristen is a bird biologist, but I was surprised at her identification. Mighty little ruby-crowned kinglets belt out their big songs in our woods each spring, but golden-crowns do not appear north of the Alaska Range on any maps of where the birds live. Neither of us remember seeing one here before. But the flaming yellow mohawk was a can’t-miss indicator that what Kristen held was indeed a female golden-crowned kinglet. That little refugee was a fun mystery during a storm that deposited more than a foot of wet snow on our patch of boreal forest in less than one day. Kristen mixed some sugar and water in a Nalgene cap and touched a few droplets to the stunned bird’s beak. Soon, she felt movement in her hands. Kristen stepped outside and held her palm open. A bird that weighed as much as two pennies stood there in the cold, moist air. After one minute, it fluttered off. First it perched on roof metal. Then it moved to an umbrella-like space beneath snowy spruce branches. A chickadee that flew into the same tree right after the kinglet looked like a giant in comparison. 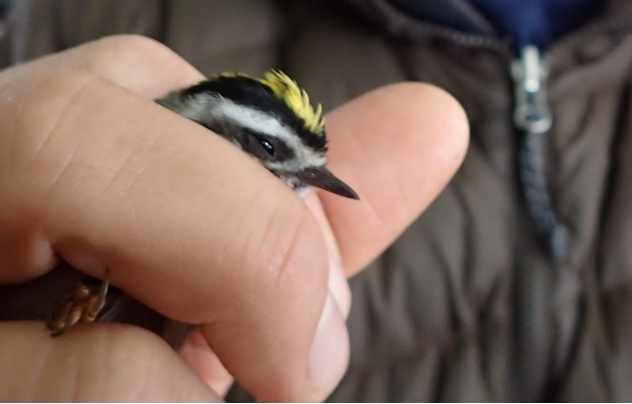 Golden-crowned kinglets are even smaller than ruby-crowned kinglets: about as big as your thumb. What was one the smallest songbirds doing in a far-north forest at the start of winter? That’s a good question. Kristen wonders if she’s heard their high-pitched chatter in our neighborhood before, mistaking them for the similar calls of brown creepers. And it’s hard to see those flitting little bodies as they branch-hop through the tips of 100-foot spruces. Maybe they are more common here than we know, and we only find them when something goes wrong. To learn more about the golden-crowned kinglet, I pulled out Bernd Heinrich’s “Winter World.” The golden-crowned kinglet is the star of the biologist’s book. One would guess that the Fairbanks kinglet was not seeking to winter here, but rather bumped into a window during its migration to somewhere south of the Alaska Range. Most maps of the bird’s range show it to wander as far north as Anchorage during the summer. Heinrich and his graduate students clubbed trees with maple staffs to find the frozen caterpillars golden-crown kinglets fed upon most often during a Maine winter. After climbing a pine tree in the dark with a flashlight, he once found four kinglets huddled together on a branch beak-to-beak, looking like a ball of fluff. As much as I root for the Fairbanks kinglet to flap its way to a milder climate for winter, I realize the bird is maybe too bold a pioneer to pass on its genes. But a good deal of mortality might be a big part of golden-crowned kinglet strategy. The birds lay an unusual amount of eggs in their hammock nests that hang beneath spruce branches. Sometimes a pair will get two nests going at once. All those babies perhaps offset 87 percent of the entire population of golden-crowned kinglets being “weeded out” every year, Heinrich wrote. He compared them to an annual plant, which regenerates each year only by seeds.